My favorite way to spend a January weekend comes to the Arvada Center January 14-17, 2009. This marks the 21st year for the event. There’s much to celebrate, the Colorado Cowboy Poetry Gathering has grown into a gang-buster event of three evening concerts plus a Sunday matinee and three full days of daytime poetry & Western music sessions. One doesn’t have to be a cowhand to appreciate the poetry and music by some of the most genuine people you’ll meet anywhere. Events kick off Thursday evening when Baxter Black, perhaps America’s most recognized cowboy poet headlines. Black captures the flaws and foibles of everyday cowboy life in his humorous poetry and presentation. Unfortunately, for those of us without reservations the evening is already sold out. Gary Robertson shares his western perspective. In addition to MMM, Prickly Pair and the Cactus Chorale offer musical entertainment. The smooth voices of the Sons of the San Joaquin star on Saturday night. We’ve been fortunate enough to see this California trio in Arizona and made sure to get our tickets early for this show – as well as the one on Friday evening. The incredible energy of Wylie and The Wild West will fill the stage for the Sunday matinee. The daytime sessions are my favorite part of the weekend. Friday and Saturday, six, hour-long sessions are held in four venues simultaneously with four performers/groups featured at each venue. More than a dozen themes help us choose which session to attend, favorites include – Western Humor, Lovesick Cowboy, Songwriter’s Circle, Women of the West and Modern Ranch Life. A full day of entertainment for $20/adult – a fantastic bargain. Milton Taylor comes all the way from New South Wales, Australia to share his Australian bush poetry. When we hear his presentation we know why he’s earned dozens of bush poetry championships. He can have us in both side-splitting laughter and tears during one session. Popular Colorado poets and performers include Bob Huff, Bill Barwick, Liz Masterson, John Nelson and the Yampa Valley Boys from Steamboat Springs. Regional artists come from all over the West – Texas to Washington state, Saskatchewan and Alberta, Canada. Nevadan Richard Elloyan, one of my favorites, returns this year. New to us is Skip Gorman from Grafton, New Hampshire. Gorman has appeared on Prairie Home Companion and his music has been featured in Ken Burns’ documentaries. I’m anxious to hear his traditional American folk music. We always leave with an assortment of CDs and books to enjoy until the next gathering. Soup and sandwiches satisfy hunger pangs between sessions. Polish the boots and join us in Arvada for an inspiring and entertaining weekend. 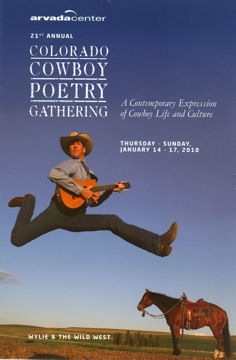 When You Go: Colorado Cowboy Poetry Gathering at the Arvada Center, January 14-17, 2009. Tickets in advance strongly advised for the evening and matinee concerts. Tickets for daytime sessions in advance or at the door.